Testimonials - Pure Island Beef Co. Pure Island Grass Fed Beef - Proven Healthier! Grass fed beef is supposed to be healthier because the fats in it are more like cold water ocean fish or flax seed oil. But does everything sold as "grass-fed" beef deliver this benefit? No, plenty of places simply sell regular beef and call it grass-fed and charge more money. Check out the facts . . . Professor Richard P. Bazinet at the University of Toronto was skeptical about grass-fed beef, so he quietly bought 14 samples of "grass fed" beef from various Toronto butcher shops and had them analyzed for the health value of their fats. Some so-called "grass-fed" was nothing more than regular beef that could not possibly have been grass-fed. The ratio of LA to ALA tells the story. If that number isn't lower than 5.0, there's no way the beef could be truly grass-fed. Look at the chart below and see for yourself. Our Pure Island beef had the lowest ratio of linoleic acid to a-linoleic acid (AL:ALA) of all the beef tested. The lower the ratio, the healthier the beef. 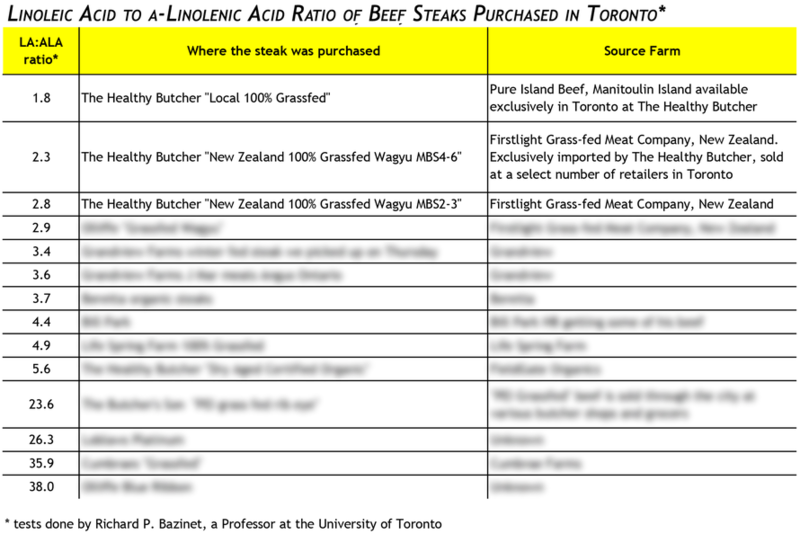 Scroll on down past the chart and you'll see testimonials from real customers about how tasty our beef is, too. If you've ever eaten grass-fed beef before, you know that good tasty, juiciness and tenderness are not always what you get. Pure Island grass-fed tastes different because it's raised different. "We loved the patties we bought from you!" "We love the taste of your product." "My mother and I tasted your beef last week at the Anchor Inn, and we loved it!!"